The Spirit's Sword: Love stories and happily ever afters. Love stories and happily ever afters. I saw this over at Mark Shea's the other day. I have often heard this sentiment echoed, particularly among people who are... more mature, shall we say?... than the average reader of Twilight. But what is it about this love story of Up, told with no words, that sets it apart from the best selling romance novel of our time? To answer that, let's begin by looking at Twilight. In terms of overall plot, Twilight is a standard romance, or fairy tale, in that it begins, in fact if not in actual words, with: "Once upon a time..." and it ends "...and they lived happily ever after." In the case of Twilight "ever after" is literally that: they will live forever, together. I do not call it a standard romance or a fairy tale as a criticism. Quite the opposite. Meyer has recognized a truth in story telling: people love reading the same story, or the same kind of story, over and over again. It was very popular in the Renaissance, for example, to write and perform plays that told the story of the ghost of a murder victim, who visits their closest male relative and demand revenge. The male relative would put on a disguise (sometimes feigning insanity) and often put on a play within the play, in order to lull the intended target into a false sense of security, all the while furthering their plans of vengeance. In the end, the vengeance is achieved but, the revenger is swept up in his own revenge, and destroyed. Many plays of this type were written, including The Spanish Tragedy, The Revenger's Tragedy, The Atheist's Tragedy, and some other play set in the rotten state of Denmark, whose name escapes me at this time. This tendency is not merely limited to the past. I think of the story of an orphan boy, who is bullied and downtrodden, who turns out to have The Power To Save Us All From Evil!!!! The boy suffers many trials, is tempted to do evil, but resists, and, in the end triumphs and saves everyone. I am, of course, speaking of Star Wars (the real one.) Or is it Harry Potter? Perhaps I meant King Arthur. Or Spiderman. Maybe I even meant Star Wars (the fake one). We tell that story because it appeals to us. We like it so much we tell it over and over again, creating new characters and new trials, but always maintaining the same shape. 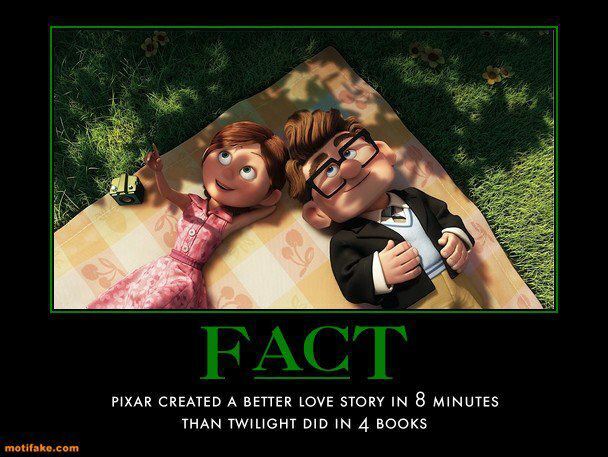 So 8it is with Romance stories, Twilight included. The couple meet, and tension develops between them. Sometimes it is love at first sight, as Edward loves Bella almost from the first time he sees, or rather smells, her. Sometimes it is hate at first sight, which can lead to terrific tension between the future lovers. There is a reason why Pride and Prejudice follows the story of Lizzie and her tempestuous relationship with Darcy rather than the tame love match between Jane and Bingley. The love/hate relationship is better suited to creating tension, frustration, and thereby, plot and a story. The problems are resolved by the two recognizing their love for each other, recognizing that they were made for each other, and then they marry and live happily ever after. Since there is very little tension between Bella and Edward, and they admit they were made for each other very early on in the story, the tension that fuels the story must come from outside the lovers. Complications with other vampires, or with werewolves, or still more vampires, and more, are what drives their story. In the end, all the complications are overcome. Bella becomes the vampire she was always meant to be, she has her daughter, her husband- even more so that they are now equals- and her best friend. They will all live throughout eternity. loving each other so simply and purely that it isn't worth the effort to tell the story, and if that story is ever told, it will be because some new threat, some new vampire shows up and interrupts their little Eden. That is the way with the fairy tale and love story. Tension fuels the story, resolving the tension ends it. Happily ever after is left unspoken and unwritten because it is undramatic. They love each other. They have each other, now and forever. They expect the feeling to last throughout their immortal lives. The end. As is the case with almost every other fairy tale and romance story, happily ever after is hinted at and alluded to. It is never written. Two people leading a happy life would be a very boring story. Except in the hands of Pixar, for the story of Carl and Ellie is exactly what is missing from Twilight and virtually every other romance story, for this is the story of Happily Ever After. We get just a few vignettes from their life, with only a few words spoken when they first meet, as children: After Ellie leaves Carl on their first meeting, the next we see of them is their wedding day, years later. In between, and what is missing, is exactly the part of the story that a Romance novel would tell, and their story really begins when a Romance ends. It is not an easy time, by any means. It is a story of hopes and dreams, some met, others not, and life interfering with their plans. And through it all we see how they love each other, in joy and in sadness, finding joy in each other and taking comfort in each other in the small things that make up married life: cleaning the house, picnics, unexpected troubles. Carl and Ellie have an ending which is problematic, an real. They know real pain, real heartache and loss. But through it all, they have each other. Until, of course, the happily ever after comes to an end with the death of Ellie. But Ellie reminds Carl, from beyond the grave as it were, with her adventure book, that her death is not the end of everything for him, and UP becomes the story of how Carl learns to live again without Ellie. Happily ever after goes on, as Carl becomes a friend to the boy, Russell, and the Dog, Dug. He shares Ellie and their love of adventure with Russell, helps the boy find his own happiness, and the happiness that was in their lives spreads out and moves on, touching lives. His happily ever after becomes a happiness that is shared, as it was with Ellie, and will move one, even after he is gone. What Twilight offers, instead, is euphoria. It is the heady, brief feeling of falling in love, which Bella and Edward believe will last, literally, forever. I suspect that, were there a real Bella and a real Edward, they would eventually get bored with each other, and those long eternal years would become an eternal prison sentence. I think of the final scene of the Twilight series, where Bella discovers that she can let Edward, who is a telepath, read her mind, She has just removed the one thing Edward found so enticing about her: her mystery, the fact that she was the only one in all the world whose mind he could not read. I imagine he would be greatly disillusioned to discover that, in the end, she was simply an average teenage girl. But that is simply my take on the matter. For her part, she has sacrificed family and friends to be with Edward. All they have is each other. Stephanie Meyers has no qualms about this: The ending is represented as a fulfillment and unproblematic. Their happiness is theirs and theirs alone. They wanted each other, and now, that is all they will ever have. There are those- a great many, judging from the sales of the books and box office at the movies- that Twilight offers an ideal vision of love and Romance: eternal teenagers forever enraptured with each other to the exclusion of all others. But there are those of us who prefer the vision of Up instead, the love that lets others in, grows and changes with the years, ever new and ever the same. The happily ever after envisioned in Twilight is a fantasy and a deception, and it is not something I would wish upon my worst enemy. The story of UP, its happily ever after, is what many of us crave in our lives: rather than fleeing from death, we recognize that our end will come in its time, and we seek to give our happiness to others, to share and pass on in their time. I like your view of the two movies, from the way you write, you seem like a very intelligent person. But i must disagree with you on Twilight. What i don't understand is WHY you would want to compare the two stories. Twilight is just a simple read - something not intended to be taken seriously. I [personally] enjoyed the books very much, but it was nothing to go crazy over; it was simply a good read. The story of UP, now, is completely different (as you so skillfully put it) and doesn't deserve to be even in the same BOAT as Twilight. Overall, i admire you ability to get your point/idea across so skillfully, but the topic of Twilight vs. UP, is completely unnecessary.